Algerian diplomats to the UN in Geneva are feeling blue. 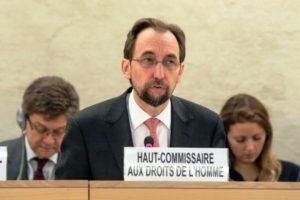 On Thursday, they could not hide their bitter disappointment when they realized that the report of the UN Human Rights Commissioner did not make any reference to alleged abuses of human rights in Western Sahara. Algerian diplomats, who focus all efforts on the defense of the Polisario’s independence claims, had convinced the leaders of a handful of delegations to co-sign a joint declaration calling on the UN Human Rights Committee (HRC) to denounce so-called human rights violations in Western Sahara. However, much to their annoyance, the HRC flatly ignored the joint declaration. Two among the signatory countries of the declaration, namely Namibia and Mozambique, are notorious for human rights abuses against their own citizens. These countries should organize their own affairs before requiring others to do so, and to refrain from giving lessons, as does Algeria, where even peaceful demonstrations are militarily disrupted and dissident voices are muzzled. Algeria, which is constantly claiming its neutrality in the Western Sahara conflict, undertook a large-scale campaign at the United Nations in Geneva, in an attempt to rally voices to its anti-Moroccan maneuvers. However, its endeavors proved fruitless. Morocco’s Permanent Representative to the UN organizations in Geneva, Mohamed Auajjar, highlighted, in a statement on behalf of 21 countries, the Kingdom’s firm commitment to the promotion and effective protection of human rights throughout the country, including in the southern provinces. He recalled that eleven UN special procedures have visited Morocco, including the Saharan cities of Dakhla and Laayoune, where they have had free access to all stakeholders, including representatives of the local civil society. In 2015, a technical mission of the Office of the High Commissioner for Human Rights visited Morocco in order to consolidate the capacity of Moroccan institutions tasked with ensuring and promoting respect for human rights, he said. The Office of the High Commissioner had expressed appreciation for the successful unfolding of the technical mission and for the support the mission received from the two regional commissions of the National Council for Human Rights ( CNDH), based in Laâyoune and Dakhla, the Moroccan diplomat recalled. It is worth recalling that part of the ceaseless efforts to upgrade the development of the Southern provinces and improve the living conditions of the populations there, King Mohammed VI announced in November 2015 a new development model for the Sahara provinces. The model provides for a number of large-scale social, medical and educational programs; and wealth and job generating projects, in the regions of Laayoune-Saqia el-Hamra, Dakhla-Oued Eddahab and Guelmim-Oued Noon.